Manpasand Beverages's IPO will be managed by Kotak Mahindra Capital and IIFL. Manpasand makes the popular beverage drink 'mango sip'. The company is looking to raise around Rs 200 crore from the IPO. The City of Los Angeles sued JP Morgan Chase, accusing the largest US bank of engaging in discriminatory mortgage lending practices that drove up foreclosures among minority borrowers. L&T is in the process of listing the two firms -- L&T Technology Services and L&T Infotech . Both will be likely to be listed in about 18-24 months time. L&T has reported a 69 per cent increase in standalone net profit to Rs 2,723 crore in the quarter ended March 31. The company on consolidated basis has posted a net profit after taxes of Rs. 4902 crore for the year ended March 31, 2014 as compared to Rs. 5206 crores for the year ended March 31, 2013. Total Income has increased from Rs. 75553 crores for the year ended March 31, 2013 to Rs. 86110 crores for the year ended March 31, 2014. The company has order book at Rs 1,62,952 crore as of March 31, an increase of 13 per cent from a year earlier, it said. Orders from overseas accounted for about 21 per cent of the total. The results were announced after the closure of exchanges. The stock will react to the results on Monday. The bench mark indices were slightly down in today's trading. This is inspite of FIIs net buying to the extent of Rs 2978 crore (including Kotak deal) in cash market. Market rumors are that FIIs have bought into pharma, auto and FMCG stocks in today's trading. In cash market segment DIIs have net sold to the extent of Rs 458 crore. In today's trade HUL gained 7%, M&m 5%, Sunpharma 4% and CIPLA, Dr Reddy's 3% each. These counters may see some more action, on next Monday. BJP led National Democratic Alliance government is open to the idea of privatizing loss-making Air India which is surviving on a bailout funded by the taxpayer. Civil aviation minister Ashok Gajapathi Raju Pusapati says his government is not averse to the idea of privatization. Among others, three things that haunts Air India are - inefficiency, idle time and frequent government interference. If privatized the effiency will improve and losses will come down. Airline making profit is a distant dream. HDFC Asset Management Company, which runs the country's top fund house HDFC MF, has come under SEBI's scanner again for alleged violations of various capital market regulations. A show-cause notice has been issued by Sebi to HDFC Asset Management Company and other entities for alleged violations of regulations and code of conduct governing mutual funds, brokerage firms and portfolio management, among others. Sebi has asked these entities to explain why penal action should not be taken against them for failing to comply with the relevant regulations. Yes Bank has plans to raise about Rs 3000 crore in a QIP offer that will strengthen its capital position. At the current market price (Rs 549 ) the company has to issue 20% of equity shares to garner Rs 3000 crore. Sunpharma's consolidated net profit stood at Rs. 3204 crore for the year ended March 31, 2014 where as the same was at Rs. 2983 crore for the year ended March 31, 2013. Total income stood at Rs. 16588 crore for the year ended March 31, 2014 where as the same was at Rs. 11611 crore in the previous fiscal. The finance ministry is seriously thinking of greater retail participation. For this purpose some tax breaks, a bigger share for retail investors in initial public offerings (IPOs)are on the cards. Ministry also likely to sell PSU shares at attractive prices to encourage larger retail participation. United Bank of India has filed a winding up petition against Vijay Mallya- promoted Kingfisher Airlines for failing to repay loans amounting to Rs 336 crore. Al Hilal Bank of UAE has successfully implemented the e banking solutions 'finacle' of Infosys. However this good news has failed to prop up the stock. The stock is under severe selling pressure since morning as the president of the company has submitted his resignation. Infosys has lost 6% or Rs 200 in the opening trade. This fall is entirely due to resignation of B G Srinivas, president of the company. The interest rates on home loans will be reduced says Urban Development Minister Venkaiah Naidu. He further indicated that BJP's mission is to provide house for all by 2020. Currently home loan interest rate ranges from 10.25% to 12%.p.a. Equity markets in U S closed a tad lower yesterday. FIIs in India have been net sellers in cash market for the last 2-3 sessions. Long positions in futures will come for square off / roll over today, the last the day of F&O expiry. SAIL and Hero MotoCorp results are below the analyst expectations. Infy too may come under pressure as its president and contender for CEO post has resigned. These developments and global cues may keep the benchmark indices in red today. B G Srinivas, President and Member of the Board, has resigned from Infosys. This is the 10th high-profile exit from the company in the last one year. Srinivas, was once seen as the top contender for the job of Infosys CEO along with Pravin Rao. Hero MotoCorp has posted a net profit after taxes of Rs. 5544.30 million for the Quarter ended March 31, 2014 where as the same was at Rs. 5742.30 million in the previous fiscal. Total Income stood at Rs. 66359.40 million for the Quarter ended March 31, 2014, as against Rs. 62502.60 million for the Quarter ended March 31, 2013. The consolidated net profit is at Rs. 21027 million for the year ended March 31, 2014. Total Income is Rs. 257196 million for the year ended March 31, 2014. The company had posted a net profit of Rs 21181 millions in FY13. Google cars wont have a steering wheel. Nor does it have mirrors, an accelerator pad or brake pedal, with software and sensors doing all the work and taking passengers where they want to go “at the push of a button,” explained Chris Urmson, director of the Self-Driving Car Project, in a blog on Google’s website. 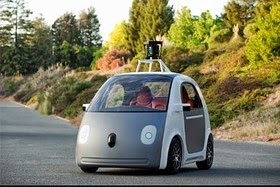 Google says just press and go on its self-driving vehicle. The Reserve Bank of India has advised urban co-operative banks (UCBs) to refrain from giving large loans to public sector or government entities, saying these transactions go against the core functions of these lenders. Infra major L&T has bagged orders worth Rs 5200 crores across various business segments. This includes orders received from Bangladesh to build two gas based power plants. The stock is up Rs 15 in the early trade. India's largest coffee retailer Cafe Coffee Day plans to list its shares on the exchanges. It is in the process of selecting the merchant bankers to the offer. Among others, the objects listing is to fund expansion and provide an exit route to PE / early investors. The company is valued around Rs 6000 crore. Tarini International's IPO will open on 9th June. The company will issue of 39.78 lakh equity shares of Rs 10 each for cash at a price of Rs 41 per share, aggregating to Rs 16 crore. The issue is scheduled to close on June 13, 2014. The company is into financial and technical consultancy related services. A report in BL says Pricewaterhouse Cooper audit report on the MCX has named leading members Edelweiss Trading and Holding, Karvy Comtrade and RiddhiSiddhi Bullions for indulging in artificial trades on the exchange platform to boost volumes. The audit report, which was uploaded on the stock exchanges Website, has identified 18,521 wash trades aggregating to ₹2,052 crore in the MCX since inception, to September 2013. Jet Airways's consolidated net loss for FY 14 stood at Rs 4130 crore, as compared to net loss of Rs 780 crore for the year ended March 31, 2013. Total Income has increased from Rs. 19409 crore for the year ended March 31, 2013 to Rs. 19445 crore for the year ended March 31, 2014. The stock closed at Rs 268, down Rs 10 yesterday. Recently Etihad Airways acquired 24% stake in the company pumping $379 millions. Without that investment Jet airways would have gone KFA way. NATIONAL ELECTION WATCH : 30 PERCENT OF MODI'S MINISTERS HAVE DECLARED CRIMINAL CASES. According to National Election Watch (NEW) and Association for Democratic Reforms (ADR), which analysed affidavits of 44 of the 46 members in the Modi's union council of ministers, thirty percent of ministers have declared criminal cases against themselves and 18 percent have declared "serious criminal cases", based on the analysis of their election affidavits. Banking reforms aimed at preventing another financial crisis have failed to make enough progress, says Ms Lagarde, the managing director of the International Monetary Fund. IMF managing director Christine Lagarde blamed a combination of the complexity involved, industry lobbying and fatigue for the delay. The industry still prizes short-term profit over long-term prudence. RBI HAS ISSUED THE FOLLOWING WARNING. and asking members of public to apply on-line for opening “RBI Savings Account”. offered by commercial banks, such as, savings bank account, current bank account or credit cards. to cause financial and other loss to them. senior officials and what to do in case of receiving such offers. BJP has indicated that foreign players will not be allowed to open mega stores in the country as it may adversely impact the small traders and farmers. This is negative news for stock market. Stocks in the retail sector may react tomorrow, to the above news. Sensex has lost 150 odd points in the first 45 minutes of trade. The fall is led by auto, bank, infra, power and metal stocks. Only two segment stocks, among Sensex stocks, are in green - tech and pharma. Motherson Sumi Systems has signed an agreement to acquire the Wiring harness Business of Stoneridge Inc. The transaction is valued at $ 65.7 million. This acquisition is expected to close in the third quarter of 2014. The acquired business has a turnover of approx. USD 300 Million. Coal India, Axis bank,SBI, BHEL, DLF,Hero MotoCorp, Maruti, PNB and NTPC will come under pressure before the F&O expiry on 29-05-2014. According to Global Web Index, WeChat, continues to experience rapid growth in monthly active users. GlobalWebIndex is a market research company specializing in online consumer behaviors, released its Q1 2014 data indicating that WeChat is growing faster than any other emerging social platform in Asia Pacific and worldwide, with a 1104% active user increase in the last year. In India, WeChat witnessed a growth of 1774.3% in its active user base. DST Global has invested $210 millions in the eCommerce company - Flipkart. Flipkart recently acquired Myntra for an estimated amount of Rs 2,000-crore. Maruti Suzuki India today launched a CNG variant of its latest compact car 'Celerio', priced at around Rs 5 lacs. However, the stock after touching 52 week high of Rs 2505, closed at Rs 2340, down Rs 46. Videocon group's entity Bharat Business Channel Limited, the DTH arm of Videocon group, would come with an initial public offer soon, according its chairman Venugopal Dhoot . Videocon d2H is the largest DTH service provider in the country with a market share of 22 per cent. The company filed papers with regulators for an IPO about 2 years ago. MoDI'S Council of Ministers will have Prime Minister, 23 Cabinet Ministers, 10 Ministers of State (Independent Charge) and 11 Ministers of State. Kumar Gangwar and Sripad Naik. Sahab Dhanwe, Vishnudev and Sudarshan Bhagat. NIFTY is on a song, up 100 points right now. The surge is led by L&T, M&M, Grasim, Coal India, Jindal Steel, Tata Motors, Axis Bank, SSLT and Tata Steel. Losers, as of now include RIL, SBI, Hindalco,BOB, Kotak Mahindra Bank, Asian Paints and DLF, among others. Muthoot Finance's net profit for FY 14 stood at Rs 780 crore as compared to Rs 1004 crore achieved in FY 13. The latest EPS comes to Rs 21 as compared to Rs 27 in FY13. Va tech Wabag has posted a net profit Rs 113.62 crore for the fiscal 2013-14, as compared to Rs 89.60 crore reported during the previous year. Total income from operations during the period grew to Rs 2,238.60 crore from Rs 1,617.27 crore in the previous year. The Rs 2 FV stock closed at Rs 976, up Rs 26, on the exchanges on Friday. Lanco Infratech has reported a net loss of Rs 584.29 crore for the Jan-March quarter, on account of drop in revenue and mounting losses in EPC and construction business. For the full year 2013-14, the company's loss widened to Rs 2,274 crore. In the previous fiscal the company had reported a net loss of Rs 1,070 crore. UK's regulation authorities are looking into the allegations against eBay with a view to taking action against them over its recent data breach. The company has recently informed its customers about the need to reset passwords. However some customers reported problems when attempting to do so. The firm has been criticized for its slow reaction in informing customers about the theft of personal data. The incident occurred in June 2012, the day after the bank was fined a record $440 millions for attempting to rig Libor. Apple now has set its eye on high-end headphone maker Beats. The deal is expected to cost Apple around $3 billion. BSE REVISES CIRCUIT FILTER FOR 117 COMPANIES. Labels: BSE REVISES CIRCUIT FILTER FOR 117 COMPANIES. BREATHER FOR SUN PHARMA, H C VACATES STAY. MARKET CAP : INFY SLIPS TO 8TH PLACE. WILL BJP FULFILL ITS POLL PROMISES? BSE NEWS: TRADE FOR TRADE STOCKS - NEW LIST.